Parcae Capital is proud to have Fan Band on its roster of clients. The sports merchandising and marketing sector continues to grow. Fan Band has strong commitment to original product lines and licensing agreements with many highly coveted and recognized professional and collegiate brands. Please read through the following information curated from their website to get a better understanding of what Fan Band is all about and where they came from. Please visit their website by clicking HERE. The Original Fan Band is the only armband on the market to bear an exact, embroidered replica of your favorite player’s or team’s jersey. The Fan Band’s unique, patent-protected design gives sports lovers of all ages an exciting new way to show their team pride. At under $15, the Fan Band revolutionizes collecting sports memorabilia; never before has it been so affordable to own and collect a jersey for every one of your favorite players and teams. Contact us to suggest a new player, team, or league! NORTH ANDOVER, Mass.–(BUSINESS WIRE)–IPC Sports recently announced the expansion of its product line to include new collegiate Fan Bands. Officially licensed Fan Bands are now available for football and basketball teams for 28 of the nation’s largest and most popular schools. Joining all 30 MLB teams and several NBA teams already in the Fan Band product line are the University of Alabama, Auburn University, University of Arkansas, University of Arizona, Arizona State University, Stanford University, Florida State University, University of Miami, University of Florida, University of Georgia, University of Illinois, Purdue University, University of Kansas, University of Kentucky, University of Louisville, Louisiana State University, Boston College, University of Missouri, University of Nebraska, Syracuse University, Oklahoma State University, Clemson University, University of South Carolina, University of Tennessee Knoxville, Texas Tech University, Texas A&M University and West Virginia University. The patented Fan Band is the only MLB, NBA and college licensed armband that’s embroidered with an exact, high-quality replica of team and player jerseys. Players, cheerleaders, celebrities and fans are all wearing the Fan Band on game day and every day. Fan Band retails for $14.99. It’s the perfect holiday gift or stocking stuffer for sports fans. For more information or to purchase Fan Bands, visit FanBand.net. 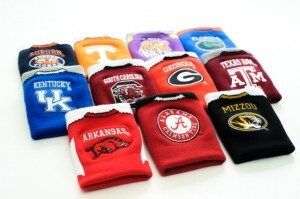 About Fan Band: Fan Band is a patented, high quality armband embroidered with a player or team jersey design. The Original Fan Band is officially licensed by the NBA, MLB and colleges, and is the only armband of its kind on the market. Fan Band can be purchased at stores, stadiums and arenas nationwide. It is also available for purchase at FanBand.net. For additional information or to schedule an interview with Holly Ruma, please email Dina Ely at Media@IPCSports.com or call Dina at (800)810-6691 ext 130.